Discounts are available for ddA-5'! 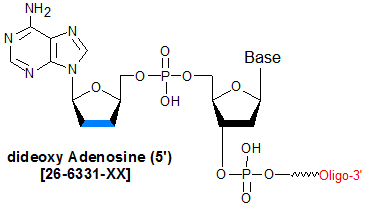 Dideoxyadenosine (ddA) is a dideoxyribonucleoside that can only be used to block the 5' end. Use ddC-3' or Spacer C3 to block the 3' end from polymerase extension. ddA is a synthetic analog of deoxyadenosine, in ddA, both the 2�- and 3�-positions of the ribose have a hydrogen (-H) group substituted for the �OH group, whereas in dA, only the 2�-position is so substituted. ddA is added to the 5�-end of an oligo via 5�-to-5� synthesis, using a 2�,3�-ddA, 5�-phosphoramidite. Purification must be by PAGE purification, since such an oligo will not have a trityl group (necessary for RPC purification). ddC-3' should be used as a 3�-end blocking moiety (see ddC technical sheet).